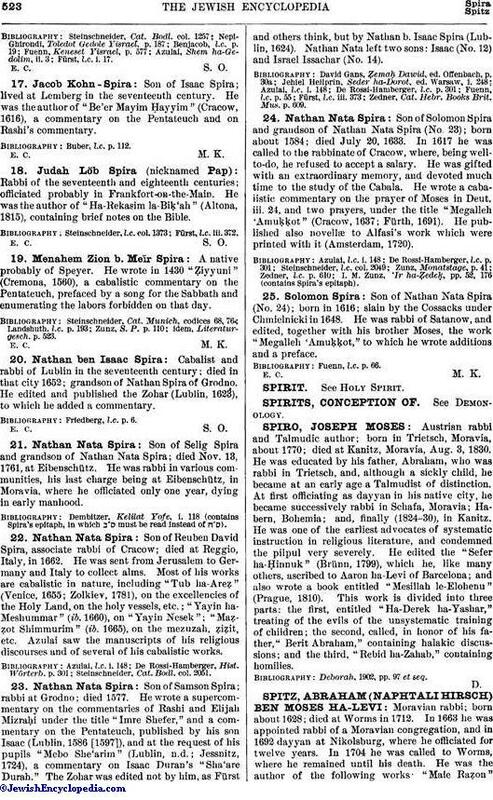 Austrian rabbi and Talmudic author; born in Trietsch, Moravia, about 1770; died at Kanitz, Moravia, Aug. 3, 1830. He was educated by his father, Abraham, who was rabbi in Trietsch, and, although a sickly child, he became at an early age a Talmudist of distinction. At first officiating as dayyan in his native city, he became successively rabbi in Schafa, Moravia; Habern, Bohemia; and, finally (1824-30), in Kanitz. He was one of the earliest advocates of systematic instruction in religious literature, and condemned the pilpul very severely. He edited the "Sefer ha-Ḥinnuk" (Brünn, 1799), which he, like many others, ascribed to Aaron ha-Levi of Barcelona; and also wrote a book entitled "Mesillah le-Elohenu" (Prague, 1810). This work is divided into three parts: the first, entitled "Ha-Derek ha-Yashar," treating of the evils of the unsystematic training of children; the second, called, in honor of his father," Berit Abraham," containing halakic discussions; and the third; "Rebid ha-Zahab," containing homilies. Deborah, 1902, pp. 97 et seq.